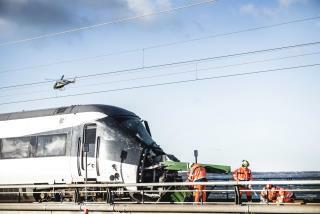 (Newser) – At least six are dead and 16 are injured in Denmark after likely debris from a freight train hit a passenger train going the other way on a bridge connecting the country's largest island with another, per Reuters and RTE. The accident on the 11-mile-long Great Belt Bridge linking Zealand, home of Copenhagen, to Funen happened early Wednesday, with a police spokesman telling reporters that "we know an object hit the [passenger] train." Initial reports said it was possibly a tarp from the freight train that flew off; other reports indicated it may have been a container that fell, per the AP. Police haven't yet confirmed the cause.